I don't have a clear explanation for my interest in guided missiles. Perhaps it is admiration for the "genuine, steely-eyed, missile-men" (Ed Harris; APOLLO 13) who conceived, designed, built and manned the missile defenses of the United States, from the 1950s to the 1980s. Books like RINGS OF SUPERSONIC STEEL and BLAZING SKIES are very interesting reading for me. 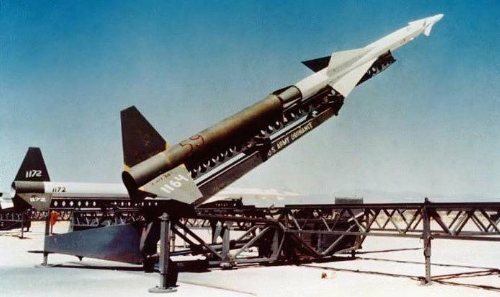 Perhaps it is a fondness for the brightly-colored 1950s plastic kits of then state-of-the-art missiles, complete with realistic launch pads. 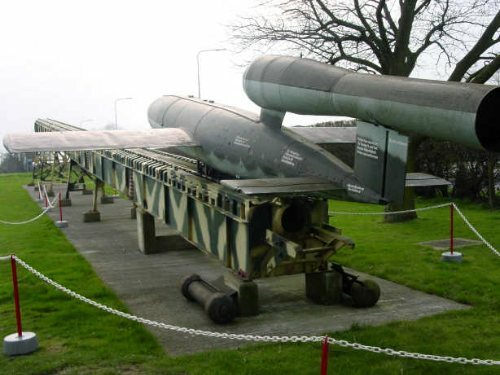 I know I was fascinated by my father's description of the German V-1 cruise missile of World War Two. 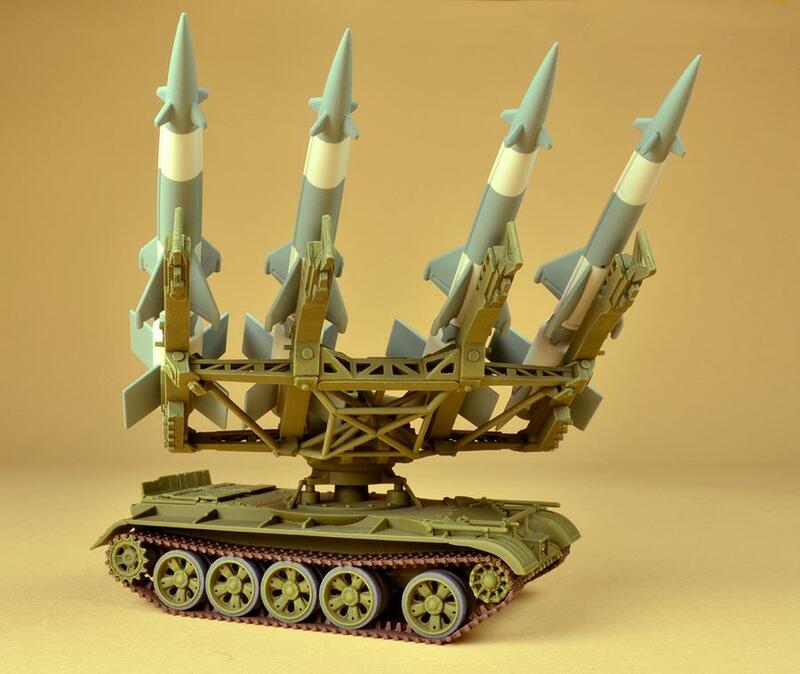 In any event, once I had scratch-built a couple of AFVs, I got the idea that I could do the same for the missiles that weren't available in kits in 1/72 scale. 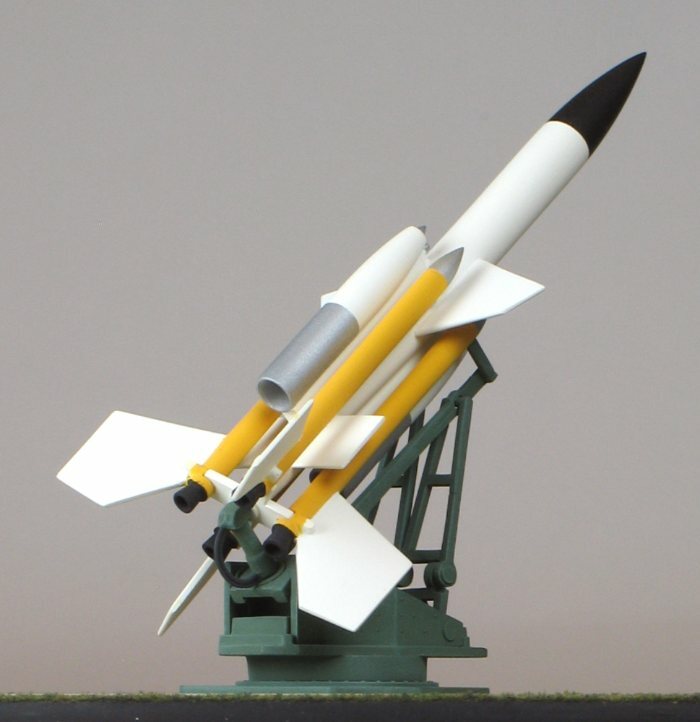 Below are several of the guided missile models I have built, from kits and from scratch. I have a few more missile subjects I would like to build, someday. This Modelcollect kit was a mixed bag: I was very happy it was produced, and it made up into a nice model, but the kit had a number of interesting problems. In my opinion, it was very over-engineered, with a far too complex assembly of way too many parts for a 1/72 scale model. I think perhaps the inexperience of the model's engineers resulted in molding weaknesses in quite a few of the components, causing them to fall apart when removed from the runners, and possibly a lack of direct experience in plastic model assembly led to very poorly-designed or non-existent mechanical connections between many of the kit's pieces. Lastly, I think compromises between accurate details on the one hand and maintaining an economical production budget on the other led to shortcuts in the finished product. If you want to see an example of what I mean, click HERE and scroll down to Replicating Open Gratings to see how I swapped out photo etch mesh and molded styrene open gratings for some of the solid plastic parts of the kit. Because of an error in the kit concerning the design of the front wheels, I opted to use replacement resin wheels by Def Model. The kit lacked the colorful air hoses mid-chassis as seen on the real HEMTTs, so I fabricated them out of .010" diameter aluminum wire from Detail Master. All paint was Humbrol (I mixed No. 34 Flat White with No. 155 Olive Drab to create three different shades, one apiece for the HEMTT, the transport/erector and the missile), except for the kit's vinyl tires at the transport, where I used Testor's Acrylic paint. I used the kit decals, which applied very well but had odd flaws in the size and location of some of the backer panels under the text. MV lenses were installed at the headlights and spot lights. A final finish of Testor's Clear Flat Lacquer was applied overall to finish the model. UPDATE: Months after I finished this model, I learned that the combination of a HEMTT tractor and a Pershing II transport/erector/missile only occurred in US Army training units within the USA. Also, the HEMTTs used with the Pershing IIs in the US had a crane installed on the chassis of the tractor. 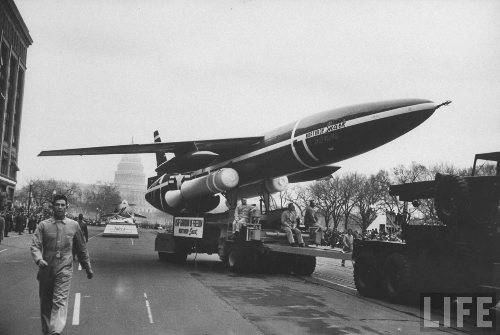 The Pershing II missiles deployed in West Germany were towed by German-built MAN 8x8 tractors. Maybe someday I'll build the Modelcollect kit of the appropriate MAN tractor. Maybe someday (if the references confim this combination), I'll build an AOSHIMA Patriot PAC III to go with this now orphaned HEMTT. 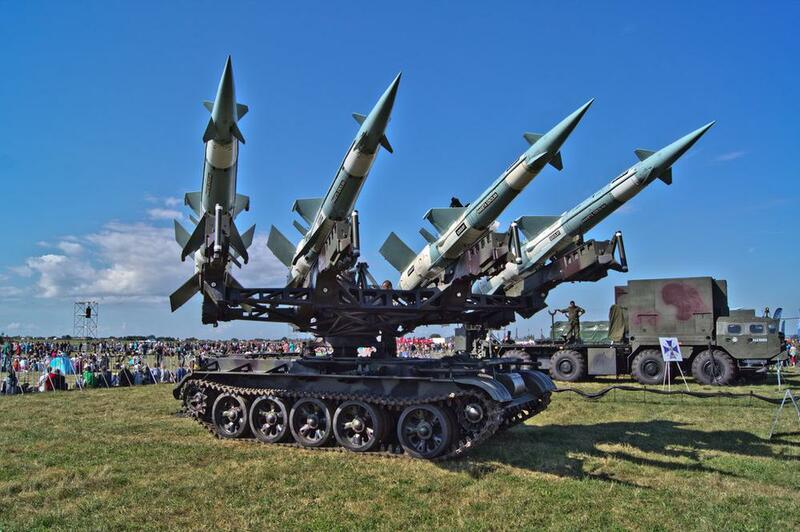 Starting in 2001, Poland began the manufacture of a mobile anti-aircraft system called the Newa SC, using the Russian S-125 Neva (NATO code name SA-3 Goa) anti-aircraft missile mounted on a Polish-built tracked chassis based on the Russian T-55 tank. 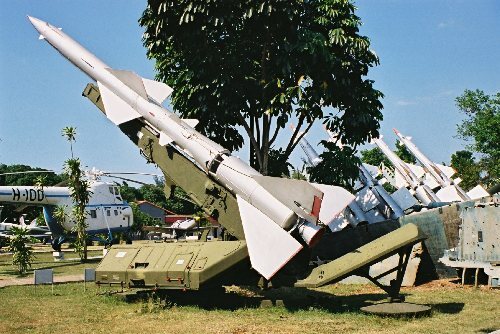 The S-125 is a low- altitude-capable surface-to-air missile originally designed for the air defense of the USSR that was widely exported to Warsaw Pact countries and allies of the Soviet Union. The T-55 was a USSR main battle tank of the 1950s, also widely exported by the Soviet Union. 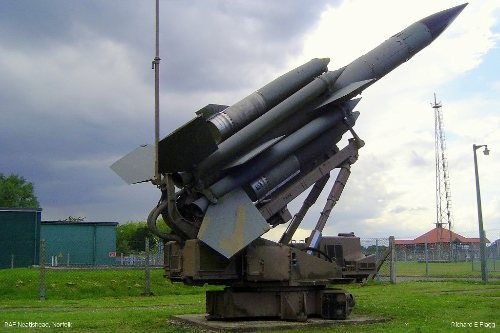 Each S-125 missile is 6.09 meters (19 feet 11 inches) long, 375 millimeters (14.5 inches) in diameter, has a wingspan of 2.2 meters (7 feet 2 inches), weighs 953 kilograms (2,100 pounds), has a range of 35 kilometers (22 miles), a top speed of Mach 3 to 3.5, with a maximum altitude of 18,000 meters (59,000 feet). I became very interested in this contraption after I saw a brilliant model of the S-125 Newa SC, built by Philippe Bonnet, displayed on the Braille Scale website. You can see this very fine model by clicking HERE. I think this machine looks like something the Japanese Ground Self-Defense Force would shoot at Godzilla, or maybe something out of the Gerry Anderson TV show The Thunderbirds. I searched for a kit of the S-125 on eBay, and eventually bought two kits by GRAN, a Russian plastic model kit company. I had a Trumpeter T-55, but before I started this kitbash, I heard that Revell of Germany was planning a state of the art kit of the T-55. I bided my time until I could buy the Revell kit, and then I started this project. The GRAN kit was good but a little primitive by modern standards, and I replaced some of the thicker, out-of-scale areas with scratch-building in Evergreen plastic (the white bits on the grey missile launcher). I modified the GRAN launcher base to match my references and attached what remained to the T-55 chassis. The Revell kit was a delight to build, and I left off the un-needed T-55 parts (such as the external fuel tanks; not a good idea around rocket exhaust) and added details unique to the Newa SC chassis, also in white Evergreen plastic. After assembly was complete, I applied Humbrol paint, including pin washes and drybrushing to bring out the details, and then Johnson's "Future" Clear Acrylic Floor Finish to even out the washes and drybrushing, followed by Testor's Clear Flat Lacquer on the T-55 chassis and the Goa missiles. Unfortunately, while spraying Testor's Clear Flat Lacquer on the missile launcher unit, the assembly fell off of the tapered bamboo stick I was using to hold the launcher during airbrushing, straight into the shallow tin filled with lacquer thinner, waiting to clean up the airbrush. Much shrieking of profane and obscene words, as I quickly fished the launcher out of the lacquer thinner, but the damage was done: the paint/pin wash/drybrush/flat coat immediately began to blister away from the plastic at the rear of the base. Once the launcher base was clean and degreased, the broken/lost details were restored, plus adding some details I missed during the original assembly. When I glued the launcher rails assembly back on the base, I corrected a slight tilt to the array, noticeable in the front and rear views, so there was a tiny, tiny sliver of a silver lining to the vast torrential storm cloud of the lacquer thinner baptism. A complete repaint/pin wash/drybrush/flat finish of the entire launcher assembly followed, as well as inking a red circle on the far, rear, right corner of the work table, where the tin containing paint/lacquer thinner/cleaner is now permanently banished. 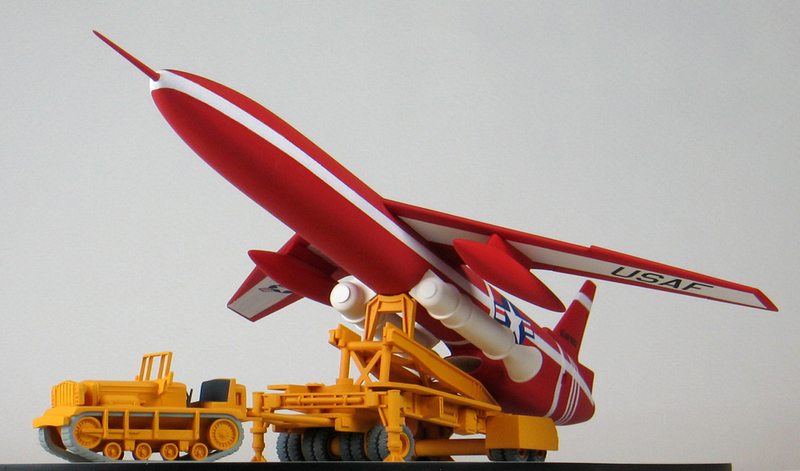 Once the missiles were installed on the launch rails, the model was done. I bought an Italeri 1/72 scale He-111 bomber kit, just to get the Dragon V-1 Buzz Bomb for this project. A splendid book V-1 The Flying Bomb had detailed illustrations of the V-1 launch ramp, which was the genesis of this project. I created an AutoCAD drawing of the ramp and its parts, and built the ramp out of Evergreen brand styrene plastic sheet, strip and structural shapes, around a brass tube at the core of the ramp that was both true to the ramp design and added strength to the model. 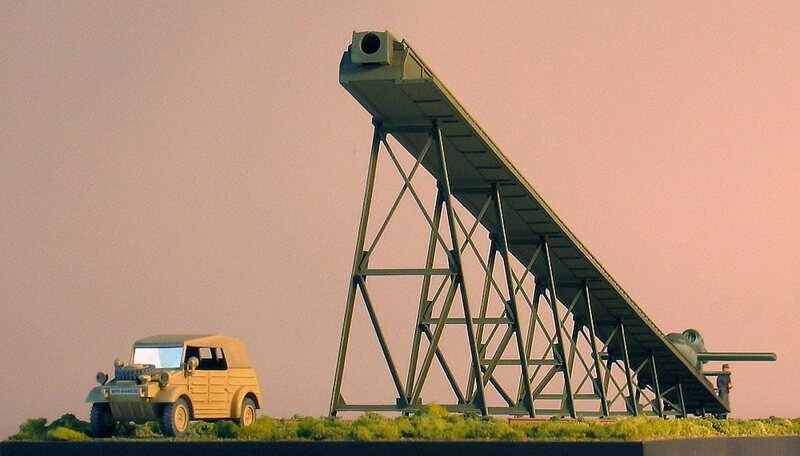 I included on the diorama base the rusty rails and railroad ties that were installed for the wheeled derrick that was used to erect these "mobile" launch ramps through-out Northern Europe in 1944. The Dragon V-1 was assembled and painted, and supplemented with a resin gas generating unit from an otherwise dreadful resin V-1 ramp kit I bought, after I started this scratch-built ramp. All paint was Humbrol, and all scenery was Woodland Scenics. The Luftwaffe officer, added to establish a sense of scale, was by Preiser figures. The Kubelwagon was by Academy. This model received a Silver Medal at the 2002 AMPS Nationals, in Havre de Grace, Maryland where, curiously enough, the model was classified as a "conversion" of the Dragon V-1. This Airfix kit is 1/76 scale, but close enough to 1/72 that I wasn't willing to scratch-build it. I followed the kit instructions for painting, matching the museum display version seen above, even though I could see that the operational Bloodhounds were usually dark green, as seen above, also. The base is a disk of Evergreen sheet styrene, with Woodland Scenics turf. Paint was by Humbrol, and flat finish was by Poly-Scale. Click on the thumbnails below to see larger images. 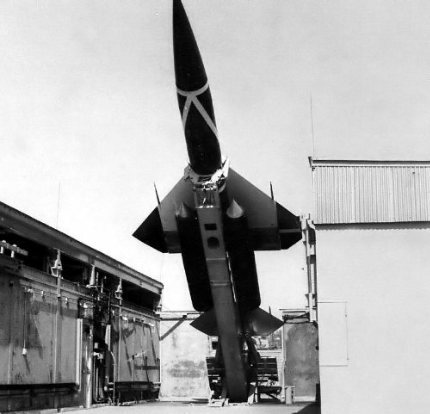 This Nike-Ajax model was my first scratch-built missile, constructed from Evergreen brand styrene sheet, rod and strip. 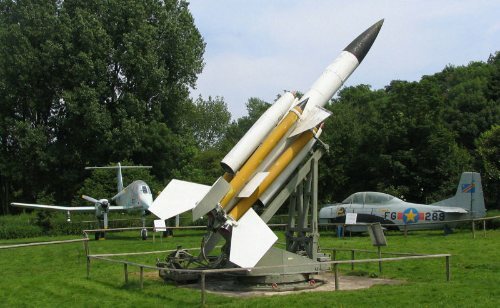 The missile was based on photos I took of the example on display at the Aberdeen Proving Ground AFV Museum, drawings from the internet, and my own Auto-CAD drawings. 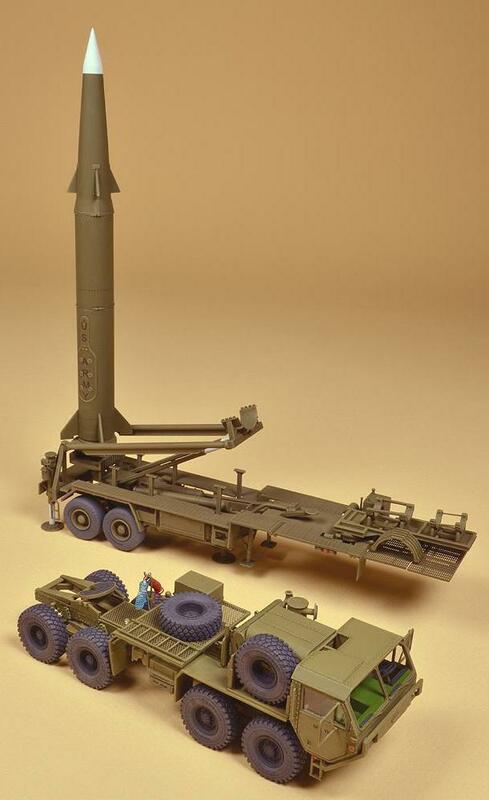 The launch pad was based on the Revell "History Makers" reissue of the Renwal 1/32 scale plastic kit. Paint was Humbrol, and flat finish was Poly-Scale. The figure included for a sense of scale was from a Hasegawa USAF Ground Support kit. This model won a Silver Medal at the (I think) 2003 AMPS National in Havre de Garce, Maryland. This model was a very old Monogram kit I bought on eBay. The scale of approximately 1/80 was smaller than my preferred 1/72 scale, but not enough of a difference to warrent scratch-building. Choose your battles. I finished my Snark in the eye-catching, test-subject red, instead of the boring, light grey operational scheme. I had to replace the unusable, ancient Monogram decals with nearly identical decals from a much newer Revell "History Makers" Snark kit. These decals exhibited one of the worst cases of silvering I've ever failed to remedy on a model. Inside the fuselage, I installed an all-but-invisible plastic engine intake fan, at the end of an intake trunk sculpted out of English Milli-Put 2-part epoxy putty. An aluminum tube at the rear completed the illusion of an engine, inside. I whittled away all of the inaccurate plastic molded around the tractor's wheels and tracks, to achieve the appropriate see-through effect. Having practically nothing in the way of references to correct or superdetail this model, I concentrated instead on having fun building this vintage kit. All paint was Humbrol, with the clear flat finish by Poly-Scale. 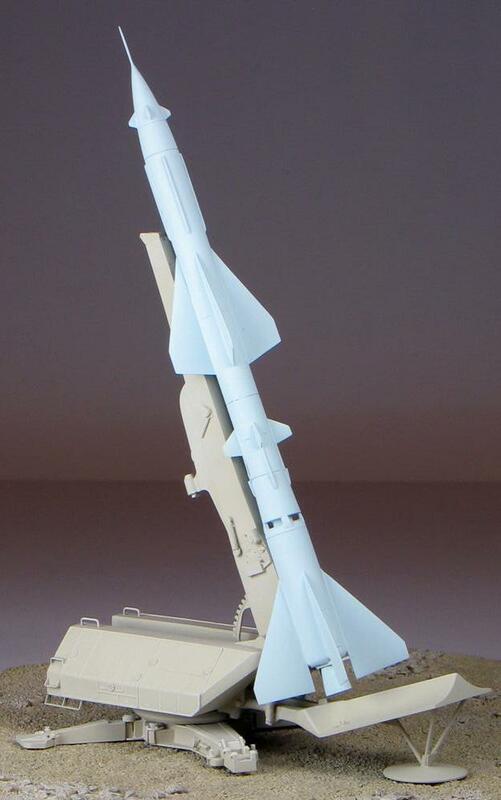 This model is the Planet Models resin kit of an SA-2 Guideline surface-to-air missile. Resin kits are assembled with cyanoacrylate glue (SuperGlue), since plastic cement won't bond to resin. The kit included the launcher. The terrain base was scratch-built of Evergreen brand sheet styrene and Woodland Scenics fine gravel. All paints were Humbrol, and flat finish was Poly-Scale. 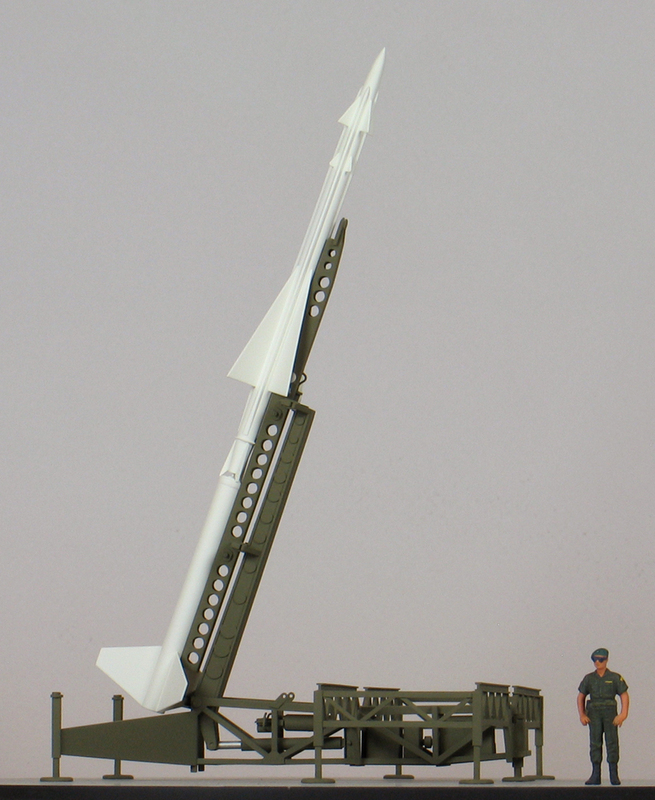 This missile was constructed from Evergreen brand styrene sheet, rod, tube, and strip, with photo-etched screens at the base. 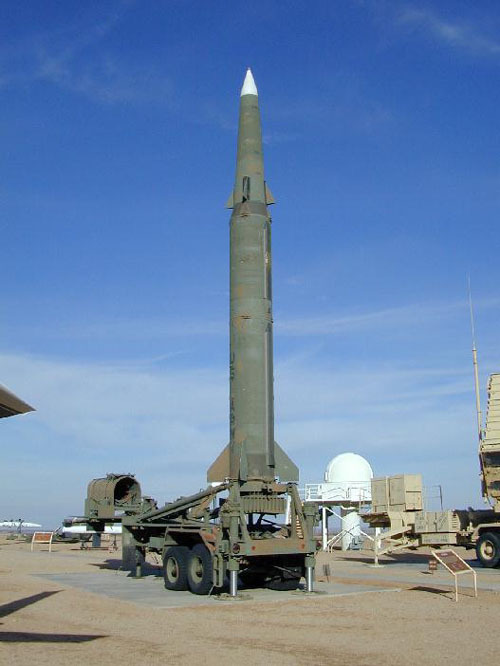 The missile was based on photos I took of the example on display at the Aberdeen Proving Ground AFV Museum, drawings from the internet, and my own Auto-CAD drawings. The launch pad was based on the Revell 1/40 scale re-issue plastic kit. The upper stage was turned on a Sherline lathe, from a solid rod of styrene plastic from U.S. Plastics Corporation. Paint was Humbrol, decals were SuperScale, and flat finish was Poly-Scale. The figure included for a sense of scale was from a Hasegawa USAF Ground Support kit. 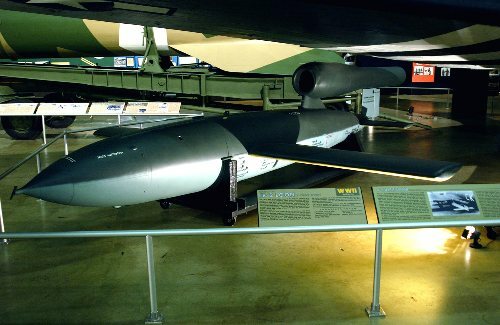 This model of the BOMARC was constructed from Evergreen brand styrene sheet, rod, tube, and strip, with photo-etched screens at the work platform. 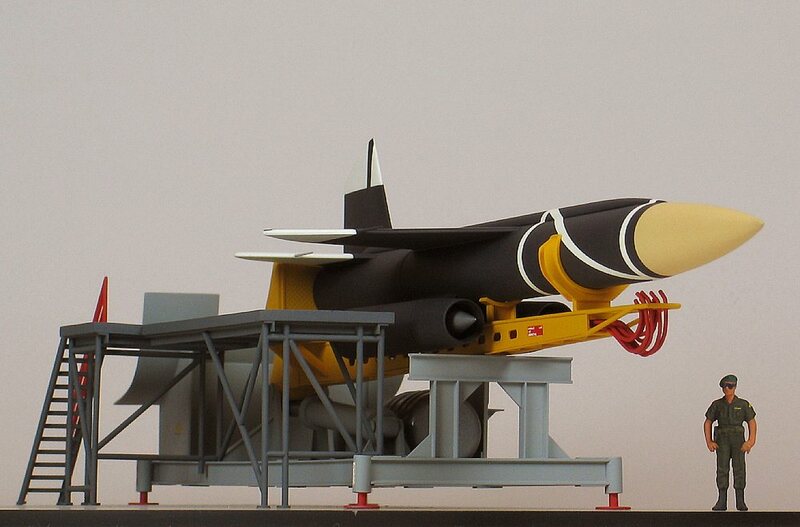 The missile was based on photos and drawings from the internet, which I developed into Auto-CAD drawings, and the launch platform was based on the Revell 1/40 scale re-issue plastic kit. The nose cone and ramjet engines were turned on a Sherline lathe, from solid rods of styrene plastic from U.S. Plastics Corporation. 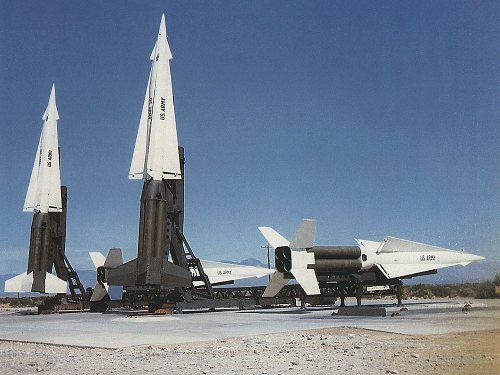 The bold black and white paint scheme represents the testing phase of the BOMARC program (as opposed to the boring, light grey operational scheme), with the monitoring cables at the nose cone disconnected to prepare for launch. Paint was Humbrol, decals were SuperScale, and flat finish was Poly-Scale. 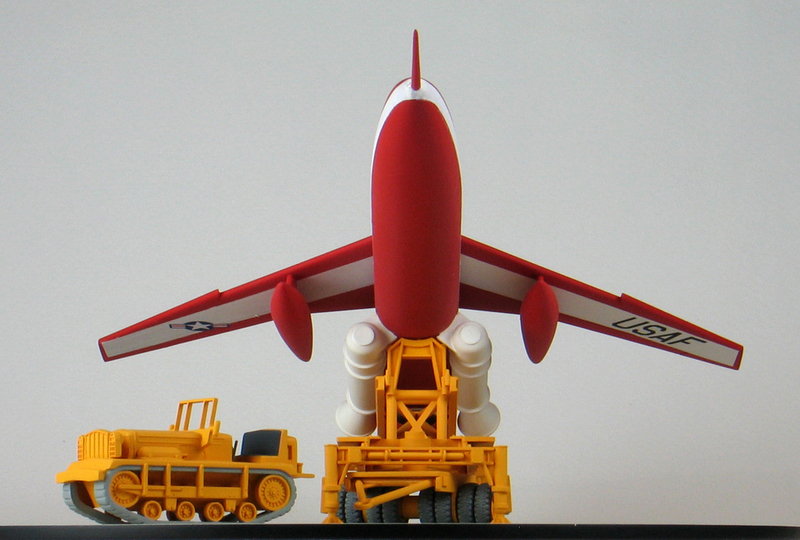 The figure included for a sense of scale was from a Hasegawa USAF Ground Support kit.